Two of the biggest beginner mistakes that happen when growing marijuana for the first time are over watering and over fertilizing. In this article, we will be going over the symptoms and cures for over fertilized marijuana plants. It’s nothing to be ashamed of, or to even throw your plants out over. A little bit of knowledge on the subject will help prevent killing your plants with too much marijuana fertilizer. 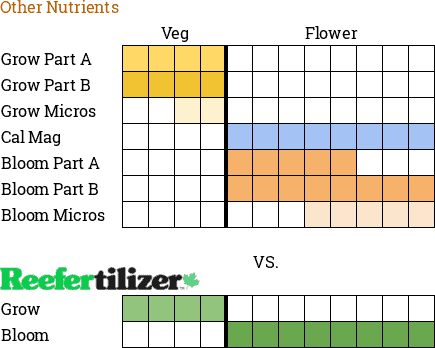 Of course, the best way to prevent over fertilized plants is to have a simple and easy to follow fertilizer feeding schedule. When I had my first grow, I grew from seeds I found online through Crop King Seeds. When the first sprouts appeared, I was very excited. They grew rather quickly too, which meant the strain of white widow I had was very good. I wanted the best for my little marijuana plants so I decided they were old enough to start feeding fertilizer. So I made a mix of grow/veg fertilizer and fed my plants twice a week with it. By following the instructions on the package of fertilizer, I thought I was in the clear. My sprouts looked great after a few weeks of feeding them. Then all of the sudden, the tips went brown, leaves decayed and my beautiful young plant was now very sick looking. What my problem was, I was fertilizing my plants way too early and giving them way too much food. A marijuana seed might not look like it, but contains enough energy to make a marijuana plant grow. With just a good seed, good soil, water, and light a plant should be able to grow from a sprout to a vegetative plant with very little coaching. The young plant doesn’t need fertilizer, it has enough nutrients to grow from the energy that the mother plant had transferred into that seed. 5 gallons of potting soil usually contains enough nutrients to feed a plant for a month. What happened with my little guys was that the sprout grew regardless of fertilizer in the soil. Once it reached the vegetative state, its roots started pulling nutrients from the soil. Since i was adding fertilizer to the soil before the plant even needed it, my soil was chock FULL of unused fertilizer. As soon as those roots started taking in the nutrients from the soil the plant started to get sick. All that buildup of fertilizer damaged the plant. You should always be careful when adding marijuana fertilizer, never add fertilizer too early. Waiting until the plant is 5-6 inches tall before adding marijuana fertilizer is a good rule of thumb in most cases. Nitrogen is the most essential nutrient for marijuana plants, knowing the signs for nitrogen deficiencies is very important. I felt like I had betrayed my little plant and wasn’t sure what to do now. So I went and looked for resources on saving over fertilized marijuana. The first thing recommended was flushing your plant. Too flush a plant you wait until the soil is fairly dry, then using a good PH balanced water you water the plant so that the water pours out of the bottom of the container. You keep doing this until you have quite a large amount of run off water, several liters in my case. Use double or even triple the volume of water to the volume of soil in your container. This helps flush the fertilizer from the soil. If the problem isn’t too severe, the plant might start looking healthy again in a day or too. The amount of flushing required depends on the make up of your growing medium, coir flushes rather well. My problem seemed much worse, my plants didn’t bounce back, I had drastically over fertilized my little plant. Most of the fan leaves had fallen off, the plant was looking like a stick with a few new leaves on top with burnt tips. A few leaves were left around the nodes, but it looked like it was done for. So I tried the second recommendation I found. 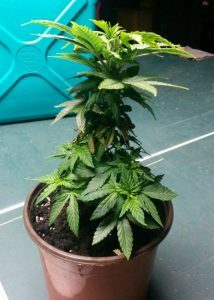 I decided to transplant the marijuana plant to a larger pot with good clean soil. The root system was substantial and packed tightly so transplanting was easy. Being very careful I transplanted the little guy to a larger container that I had planned to use when the plant was larger. A few days later after watering with good clean pH balanced water, it returned to being lush and green. The underdeveloped leaves at the nodes grew new fan leaves, but a few dying leaves remained. The plant had gone from brown and black to bright beautiful green again. This plant won’t be the same as a plant that had been perfectly balanced from the beginning. A recovered plant will still succeed in it’s purpose to produce a few nice buds. We are all beginners at some point or another and mistakes happen. As long as your trying to give your plants the best you can, they will repay you in the long run. 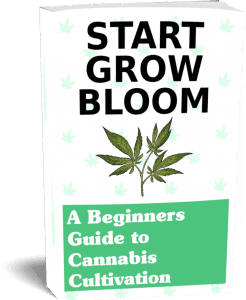 It takes time to master the art of growing marijuana. Looking for advice from other growers is amazingly helpful, I guess that may be why your here in the first place! I will be writing other articles about all sorts of growing topics. If you have any ideas of what you would like me to cover or other tips about helping over fertilized marijuana plants, please leave a comment below. Happy Growing! 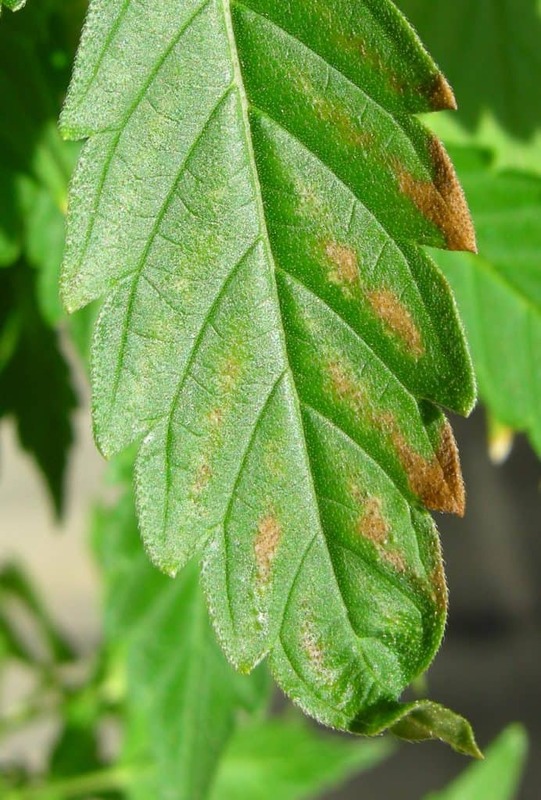 You may have over fertilized your marijuana plants, but all is not lost. Flushing and transplanting can help bring sickly plants back to life. The best practice, of course, is to never over fertilize them in the first place. 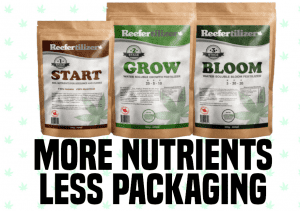 Reefertilizer makes feeding your plants simpler and quicker.